BACKGROUND: Chemerin, encoded by the retinoic acid receptor responder 2 (RARRES2) gene is an adipocytesecreted protein with autocrine/paracrine functions in adipose tissue, metabolism and inflammation with a recently described function in vascular tone regulation, liver, steatosis, etc. This molecule is believed to represent a critical endocrine signal linking obesity to diabetes. There are no data available regarding evolution of RARRES2 in non-human primates and great apes. Expression profile and orthology in RARRES2 genes are unknown aspects in the biology of this multigene family in primates. Thus; we attempt to describe expression profile and phylogenetic relationship as complementary knowledge in the function of this gene in primates. To do that, we performed A RT-PCR from different tissues obtained during necropsies. Also we tested the hypotheses of positive evolution, purifying selection, and neutrality. 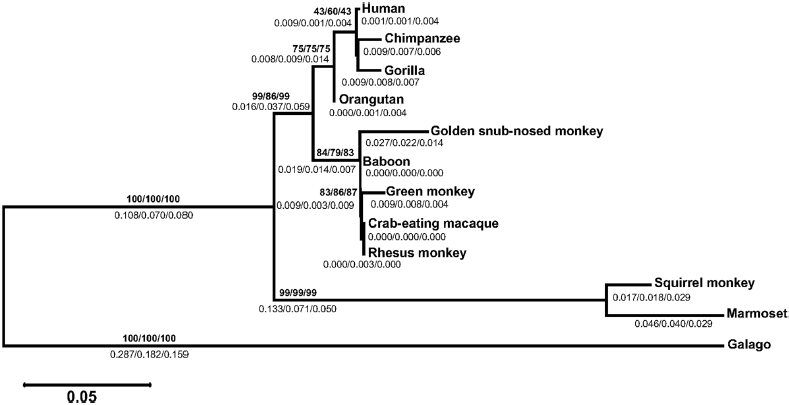 And finally a phylogenetic analysis was made between primates RARRES2 protein. RESULTS: RARRES2 transcripts were present in liver, lung, adipose tissue, ovary, pancreas, heart, hypothalamus and pituitary tissues. Expression in kidney and leukocytes were not detectable in either species. It was determined that the studied genes are orthologous. CONCLUSIONS: RARRES2 evolution fits the hypothesis of purifying selection. 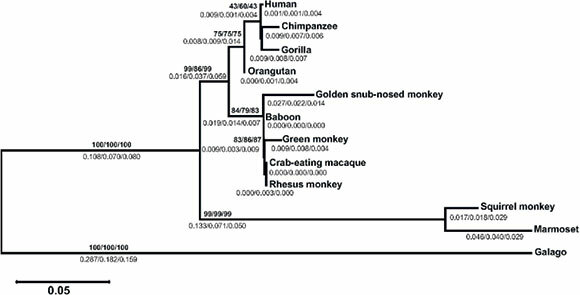 Expression profiles of the RARRES2 gene are similar in baboons and chimpanzees and are also phylogenetically related. Chemerine is a protein that initiates chemotaxis via the ChemR23 - G protein-coupled seven-trans-membrane domain receptor ligand, which has been classified as an adipokine due to its role in adipocyte differentiation and glucose uptake . It also plays a potential role in controlling immune responses at sites of tissue injury and inflammation , including chronic inflammation of adipose tissue in obesity [1, 3-5]. Chemerine has also been suggested as an essential endocrine signal, linking obesity to insulin resistance [3, 6-8], therefore it is an independent biomarker of metabolic syndrome [9-12]. In addition to adipose tissue, chemerine plays an important role in metabolic regulation in the liver and skeletal muscle [6, 13]. Recently a novel role for chemerine as a stimulator of angiogenesis was identified . The retinoic acid receptor responder protein 2 (RARRES2) gene (also named RAR-responsive protein TIG2, chemerin and tazarotene-induced gene 2 protein), which encodes chemerine, is located in chromosome 7 at 7q36.1 in humans. RARRES2 mRNA is highly expressed in white adipose tissue, liver and lungs, while the mRNA for chemerine receptor is predominantly expressed in immune cells and adipose tissue [14-20]. The study of the evolution of Old World primates (OWM) and great apes has been an excellent approach to understand human pathology such as metabolic syndrome. Currently, the baboon (Papio spp) has been proven to be an ideal model to study metabolism disturbances. Previous studies have found a substantial variation in weight and body composition in adult baboons sharing the same diet and living conditions. Baboons spontaneously develop obesity , type 2 diabetes mellitus (T2DM)  and a metabolic syndrome-like phenotype has been described in this species . While the RARRES2 gene sequence has been described in humans, there is no information available regarding baboon and chimpanzee. The present study analyzed the expression profile and phylogenetic relationship of the RARRES2 gene from baboon and chimpanzee. In the PCR from genomic DNA, a single band of 3,257 bp was visualized for both primates (data not shown). In a similar manner in the PCR from cDNA, only one product of 641 bp was observed for both primates. PCR product sizes and nucleotide sequence are not sufficient to determine absence of paralogous genes, but with the evidence given at the moment could be that there is only one RARRES2 gene for each of the two species studied, baboon and chimpanzee. Both genes are organized in six exons and five introns of variable size: exon 1,110 pb; intron A, 948 pb; exon 2, 194 pb; intron B, 231 pb; exon 3, 105 pb; intron C, 1018 pb; exon 4, 96 pb; intron D, 244 pb; exon 5,127 pb; intron E, 175 pb; and exon 6, 121 pb. For each species, RARRES2 transcripts were amplified from liver, lung, adipose tissue, ovary, pancreas, heart, hypothalamus, and pituitary gland. Expression in kidney and leucocytes was not detected. Negative and positive controls gave the expected results (Fig. 1). All PCR products were cloned and sequenced. For every primate, at least three independent clones were sequenced for each gene and transcript. Baboon and chimpanzee mRNA sequences resulted identical for all tissues. The phylogenetic tree (Fig. 2) shows four clades in a lineage specific manner. These clades correspond to apes, OWM, NWM and lemur (out-group). It confirms the orthology between primate RARRES2 genes. Bootstrap values are shown on the tree's branches. Similar results were obtained using Maximum Likelihood (ML), Neighbor-Joining (NJ) and UPGMA phylogenetic methods. We confirmed that RARRES2 evolution fits the hypothesis of purifying selection (P < 0.05) for OWM (except for green monkey) and apes. Since for RARRES2 from NWM the tests did not yield statistically significant differences (P > 0.05), at this moment it is unclear which forces govern their evolution. Neutrality is observed for orangutan, rhesus monkey and crab-eating macaque RARRES2 genes (Table 1). 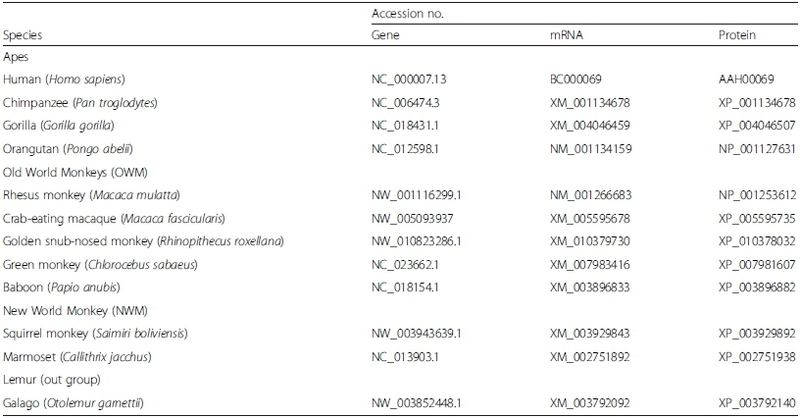 This is the first report showing the expression profile of the novel RARRES2 mRNA in different tissues from baboon and chimpanzee. The novel finding of this study is that in baboon and chimpanzee, there is expression in the pituitary gland, while in humans RARRES2 was not detected in this tissue. In humans, expression in kidney has been reported (ETS profile at the NCBI, UniGene), while in baboon and chimpanzee in our study it was not detected. To address this difference studies such as; promoters alignment, bioinformatics analyses to predict transcptional factors bindings sites, searching CpG islands susceptible to be methylated, as others; are needed. Similarity in the expression pattern suggests that mechanisms of regulation of gene expression are similar in the three species. It also suggests that the RARRES2 gene might have similar physiological effects. However more studies in functional differences are needed, such as studying the expression profile under different conditions such as insulin resistance, obesity, fasting or others associated with metabolic syndrome. We found that the RARRES2 cDNA sequence in baboonand chimpanzee have a high similarity to others apes. The conservation of exon-intron boundaries and absence of obvious mutations suggest that the baboon and chimpanzee RARRES2 genes are functional. Positive selection (dN >dS) implies that the substitutions mostly non-synonymous are functional and benefit the organism, conferring some evolutionary advantage. While purifying selection (dN<dS) indicates that evolutionary pressure has been relaxed. The dN and dS rates show that the evolutionary force actually acting on these is the purification of the selection (P < 0.05). Fit hypothesis of purifying of selection is a clue that these genes are functional in the studied species, because there are not functional genes that do not fit this hypothesis. Although we did not do an analysis between the expression profiles of primate RARRES2 genes and their putative binding sites for known transcriptional factors, we speculate that this evolutionary force has been relaxed perhaps because in apes and OWM the functions and/or regulatory mechanisms are not necessarily the same as those governing NWM or lemurs. However, more research is needed to investigate the role of this molecule in physiology and regulatory expression profiles. The phylogenetic relationship between NWM, OWM and apes RARRRES proteins was determined to evaluate their evolution in primates. The phylogenetic tree (Fig. 2) showed three clades in a linage-specific manner. These clades corresponded to NWM, OWM and apes, finally galago (out-group). Tree's topology, length's branches and Bootstrap values are similar using either phylogenetic method (ML/NJ/UPGMA). This confirms orthology within the RARRES gene. Bootstrap values are shown bold on the branches of the tree; below of Bootstrap values are shown branches length estimated by the same methods (ML/NJ/UPGMA). We found that there is only one RARRES2 gene for baboon and chimpanzee. RARRES2 transcripts were present in liver, lung, adipose tissue, ovary, pancreas, heart, hypothalamus and pituitary tissues from both primates. The dNand dSrates conclusively show that these genes have no positive selection. RARRES2 evolution fits the hypothesis of purifying selection. The studied sequences are clearly orthologous. The baboons (Papio anubis) and chimpanzees (Pan troglodytes) were housed at the Southwest National Primate Research Center in San Antonio, TX; an AAALAC-accredited facility at the Texas Biomedical Research Institute. These animals are housed with indoor-outdoor access in standard stainless steel cages with covered shelters equipped with external containers for food and ad libitum access to water. The protocol was approved by the IACUC of the Texas Biomedical Research Institute for all procedures. The liver, lung, adipose tissue, ovary, pancreas, heart, hypothalamus, pituitary gland, kidney and total leukocytes were collected at routine necropsy and stored at -80 °C until further evaluation. Baboon tissues came from three different animals, while chimpanzee tissues came from a single female that underwent humane euthanasia due to a complication of diabetes. Total RNA and DNA of the different tissues and leukocytes were extracted with Trizol reagent according to the manufacturer's instructions (Invitrogen, Carlsbad, CA). RNA was treated with RQ1 DNase (Promega, Madison, WI) for 15 min at 37 °C to remove traces of genomic DNA. The purity and integrity of RNA and DNA were assessed using standard spectrophotometry methods with Nano-Drop equipment (Thermo Scientific, Wilmington, DE) and agarose gel electrophoresis. Total RNA from frozen tissues (~1.0 μg) was retrotranscribed according to the manufacturer's instructions with a High Capacity cDNA Reverse Transcription (RT) kit (Applied Biosystems, Foster City, CA) into a 50 μL final volume. A primer set to amplify baboon and chimpanzee's RARRES2 transcripts was designed using RARRES2 sequences from rhesus monkey (Macaca mulatta) and humans (Homo sapiens) as templates. Sequence templates are deposited in the NCBI (Table 2) [http://www.ncbi.nlm.nih.gov/]. Such design used an online tool . Sense primer (5 '-GGACAGCGAGGC CAAGAT-3') hybridizes in exon one at nucleotide 68 prior to the start codon (AUG). Antisense primer (5' -CTGGGGTCTTCCACTGGTTAC-3') hybridizes in exon six at nucleotide after the stop triplet (UAA) (positions referent to the RNA molecule). For PCR we used 5 μL of RT reaction or 200 ng of genomic DNA as templates, 10 μM of each primer and the 2X PCR master mix kit (Qiagen, Valencia, CA). The reactions were performed in a25 μL final volume carried out in a Veriti thermal cycler (Applied Biosystems, Foster City, CA), with the following amplification programs: first for RT samples, an initial denaturalization step for 3 min at 94 °C; then 30 cycles of30 s at 94 °C, 30 s at 58 °C, and 30 s at 72 °C; finally anelongation step of 6 min at 72 °C. Second for genomic DNA samples, an initial denaturalization step for 4 min at94 °C; then 30 cycles of 1 min at 94 °C, 30 s at 58 °C,2.5 min at 72 °C; finally an elongation step of 15 min at 72 °C. Primers for ribosomal RNA fraction 18S (AppliedBiosystems, Foster City, CA), were used as RT positive controls (324 bp in size). The amplification reactions were confirmed in 1 % agarose electrophoresis gel stained with ethidium bromide and visualized with UV light. 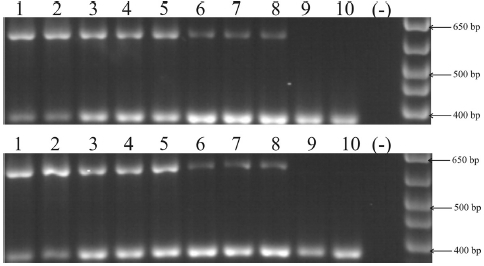 PCR products were cloned using a 3.5 kb-XL-TOPO-vector kit and transformed in the electrocompetent bacterium E. coli strain Top 10. These procedures were performed according to the manufacturer's specifications (Invitrogen, Carlsbad, CA). The positive clones were sequenced using a Big Dye terminator kit and either specific or universal (M13) primers. The reactions were analyzed with an ABI PRISM 3100 Genetic Analyzer and in its software (Applied Bio-systems, Foster City, CA). The information obtained from the sequencing assays was subjected to a BLAST test to determine identity. The structures of intron-exon boundaries of each one of the baboon and chimpanzee RARRES2 genes were determined by directly retrieving information given at the NCBI server. Alignments were performed using the CLUSTAL W program . 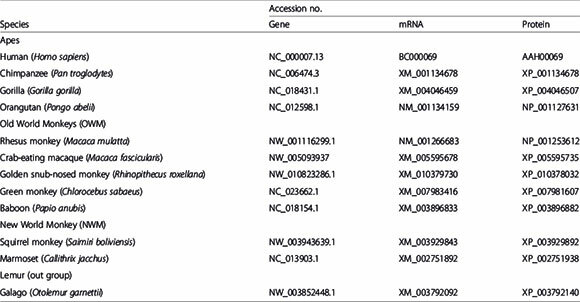 GenBank accession numbers ofthe sequences used in this study are provided in Table 2. From amino acidic sequence, a phylogenetic tree was built with MEGA 6.06 software  using the Maximum Likelihood (ML), Neighbor-Joining (NJ) and UPGMA methods, thena bootstrap test was done with 1,000 replicates . Seeking to identify the evolutionary forces that underlie the process of divergence in the RARRES2 primate genes, we tested the hypothesis of positive or adaptive evolution (dN >dS), purifying selection (dN <dS) and neutrality (dN = dS). For this purpose;first, we calculated the non-synonymous (causes an amino acid change) and synonymous (does not cause an amino acid change) dN, dSdistances, respectively, by the the Li-Wu-Luo method (Kimura 2-parameters)  from RARRES2' coding sequences from apes, OWM and NWM with their lemur's counterpart. Second, we tested whether dN is significantly greater, lower or equal, respectively, than dSusing codon-based Z test of selection as implemented in MEGA 6.06 software . Differences were considered statistically significant at a P <0.05. RARRES2: Retinoic acid receptor responder protein 2; OWM: Old World primates; T2DM: Type 2 diabetes mellitus. RGA development the alignment and phylogenetic analysis; MLGR, IDG, VMTA, LEMDV, RCDC, ALT and MET carried out primer designed, nucleic acid extraction, performed RT-PCR assays, molecular cloning; RGG and OBQ sequenced the respective recombinant plasmids; NESL, MDRRP, SAC and DRP carried out the design of the study;MMA, AGC, HABS and IPRS participated in the design, coordination and writing of the manuscript. All authors read and approved the final manuscript. The present work was supported by grants from the Mexican Council of Science and Technology, CONACyT (167697 and 157965). The authors gratefully acknowledge the critical reading of the manuscript by Sergio Lozano-Rodríguez, MD.